WASHINGTON (July 17, 2009) -- In his last days as the Army's 20th secretary, Pete Geren opened up about issues he faced during his tenure, including the challenge of an ongoing war, advancing medical care for Soldiers, and the importance of families. Secretary of the Army Pete Geren took office March 9, 2007 in the midst of two wars -- one in Iraq and one in Afghanistan. 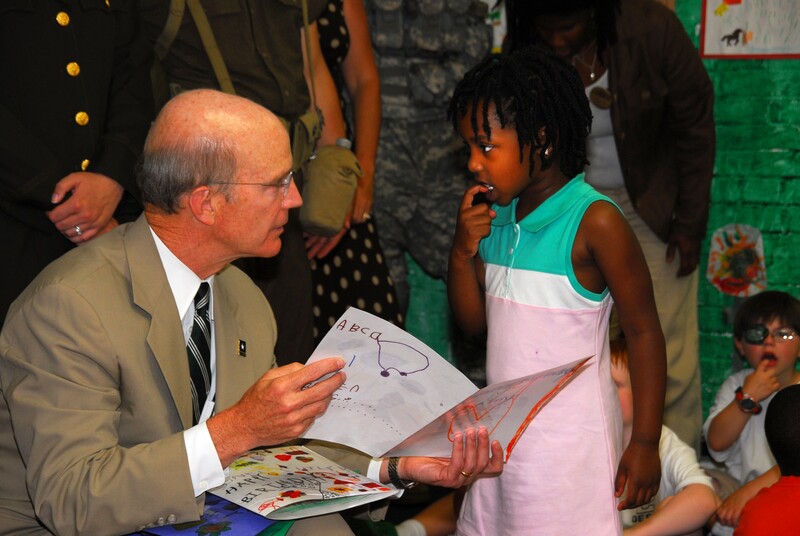 Children at the Fort Myer, Va. Child Development Center presented birthday cards to Secretary of the Army Pete Geren, June 9, 2008. Geren made an appearance at the CDC to read to the children a new book, by Army Youth Services, called "Happy Birthday Army." The book was part of an effort by the secretary to better include Army youth in the service's 233rd birthday celebrations. Geren said that the Army's performance in those wars, as an all-volunteer force, is noteworthy because those conflicts are the longest wars the Army has ever fought using an all-volunteer force. "Most people never believed you could conduct an extended war with an all-volunteer force -- and the extraordinary Soldiers and families we have, have proven those people wrong," he said. During that time, Soldiers have remained committed to the fight and their families have remained supportive of their Soldiers. Geren said in the future, Americans will look back and remember those sacrifices. "When we look over the last eight years, that's what people will remember most about the Army -- how our Army stepped up and responded to the challenge of our nation at war," he said. "Our Soldiers have responded with great distinction, as have their families." During his time as secretary, Geren developed programs like the Army Family Covenant, the Army Community Covenant and Warrior Transition Units. He also was responsible for directing Army and national attention to the contributions of noncommissioned officers by designating 2009 as "The Year of the NCO." With the Year of the NCO, Geren said he hoped to build recognition for the contributions NCOs make to the Army. He also hoped to better inform Congress of their importance and additionally hoped to increase professional development opportunities. "We are halfway through the year now and I hope the NCOs understand how much we appreciate what they do," Geren said. "They are the backbone of our Army. Most militaries around the world don't have the same level of professionalism and responsibility in their NCO corps. But our NCOs are the glue that have held this Army together during this critically important time in our nation's history." As secretary, Geren dealt with the fallout from the revelation that outpatient care at Walter Reed Army Medical Center in Washington, D.C., was inadequate. His leadership changed the way the Army delivers outpatient care to Soldiers through development of Warrior Transition Units. "An area we changed a great deal over the last couple of years has been outpatient care," Geren said. "The need for outpatient care has grown considerably over the last several years, so the development of the Warrior Transition Unit is a way to deliver outpatient care. We have 36 of those around the country and around the Army system. It is a completely new approach to taking care of outpatients -- it is better organized, and it is focused on the needs of outpatients." The secretary said he believes WTUs will end up being a model for other services. Through development of the Army Community Covenant and the Army Family Covenant, Geren institutionalized both the service's commitment to be good partners in the communities where it resides and its recognition of the family's contributions to the mission. "Our Soldiers can't do their jobs if their families are not able to stand and support them," he said. "We've got a different Army than we did 30-40 years ago. More than half the Army is married. There are 700-800,000 kids in Army families. Their Soldier/loved ones are going to far-off places, risking their lives, and giving their lives in some places. We as a country have a duty to those families." As part of the Army Family Covenant, Army funding to family programs doubled from $700 million to $1.4 billion. The funding provides for increased family programs, childcare for spouses when Soldiers deploy, and youth and recreational programs. Despite his contributions to the Army while serving as its secretary, Geren remains humble. "I'm one of many people working with the Army to support all these various initiatives," he said. "I consider this opportunity I've had to work with the Army, with Soldiers and civilians and Army families, to really be the most rewarding period in my life. I'm like one of the 299 million Americans that have this great debt to all that wear the uniform -- and I am proud of having an opportunity over these three-and-a-half years to be part of the American public's support of Soldiers and families." Geren says that after his departure, it is the Soldiers he will miss the most -- interacting with them on a day-to-day basis, and working alongside them. "When I came into the Army, it was like I stepped iside the frame of a Norman Rockwell painting," he said. "I saw there are wonderful men and women that are in the Army -- they love their country, care deeply about service, and they believe in something greater than themselves. More than anything else I'll come away from this experience with a great appreciation for the ethics and the values of the Army. It's really an island of idealism in an otherwise 'me first' world today. It's really been uplifting and inspiring to work with Soldiers, and the mission focus they have is contagious." In the future, Geren said, the Army will continue to face challenges -- but he said the Army will continue to focus on supporting the family, continue to evolve healthcare, and can expect to continue to face the challenges of supporting Soldiers in overseas operations. "How do we support those 140,000-150,000 Soldiers that are deployed around the world to get them what they need, when they need it, and make sure the bureaucracy doesn't stand in the way of responding to their immediate needs?" Geren asked. "I see the continuing years as a continuation of what we have worked on for these many years since 9/11." President Barack Obama recently announced his selection of the next Army secretary, Rep. John McHugh of New York. Geren said he has been friends with McHugh for a long time, and expects McHugh will perform well as the new secretary. "He brings tremendous experience to the job," Geren said. "I was very excited for him and for the Army when the president made the choice he did. My successor brings more experience to this job than I brought to the job. He's going to hit the ground running."